JEC indeed was a success for Cevotec. 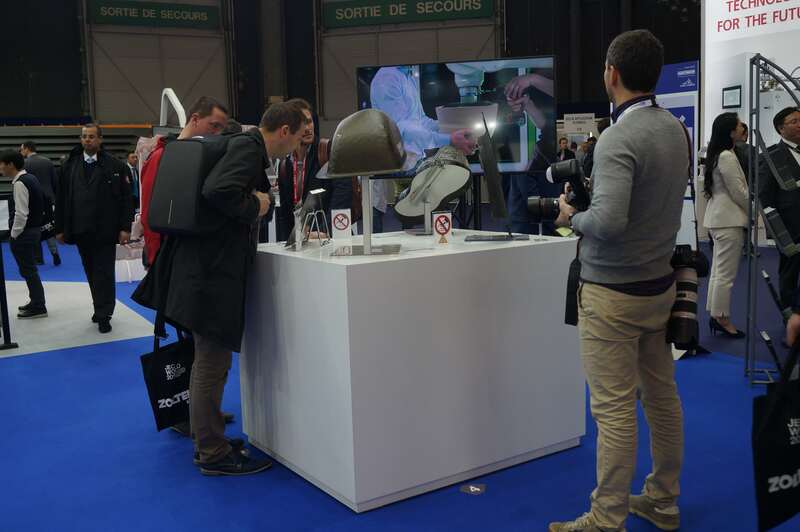 Our showpieces at aero & space planet were photographed nearly as often as the Louvre, our booth Q73 was very frequently visited by current and future customers, and particularly our engine nacelle part built for SAFRAN Nacelles gained much interest. Let’s review on those three days in Paris-Villepinte and preview on upcoming events. 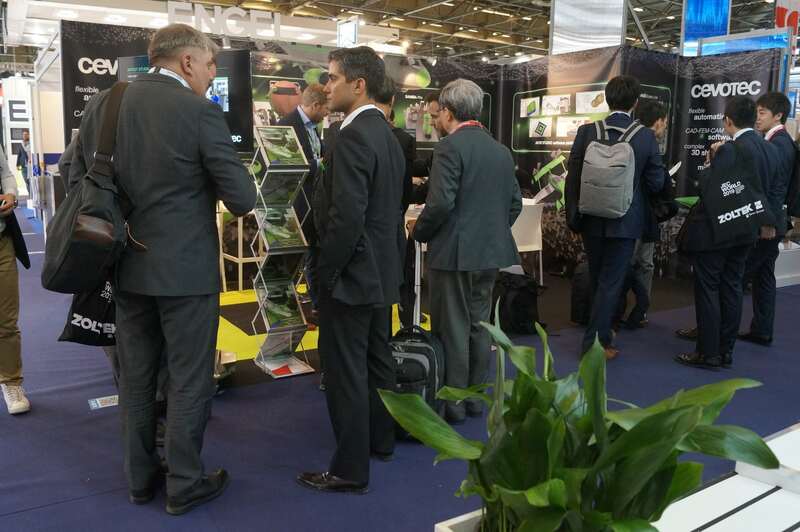 It was a pleasure to see all the people gathering around our line-up of demonstrator parts at the aero & space planet at JEC World. Obviously, patched aerospace components are of high interest. JEC visitors loved to learn more about the honeycomb part with chamfered transitions showing the different material layers of a major component of an engine nacelle structure, developed together with SAFRAN. Also very popular: The award-winning complex-shaped operating box cover, developed in cooperation with Premium AEROTEC. 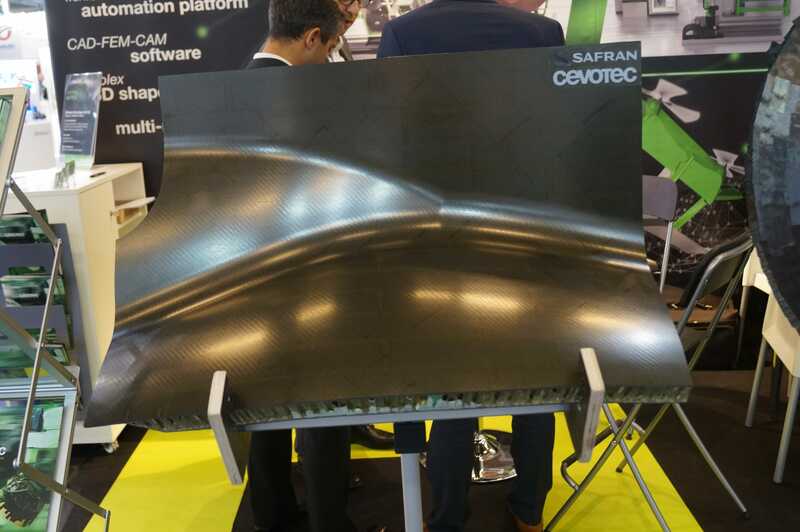 At our booth, we showcased a bigger part of the multi-material component of an engine nacelle structure. The part, whose different material layers were patched additively and fully automated in one single SAMBA Multi production system, was an attraction to the public. Our booth was very frequently visited by current and future customers. Also, the interest in our three JEC presentations at Altair conference, technical conference and – together with Premium AEROTEC – at Composites Xchange Forum. Thanks to the audiences! 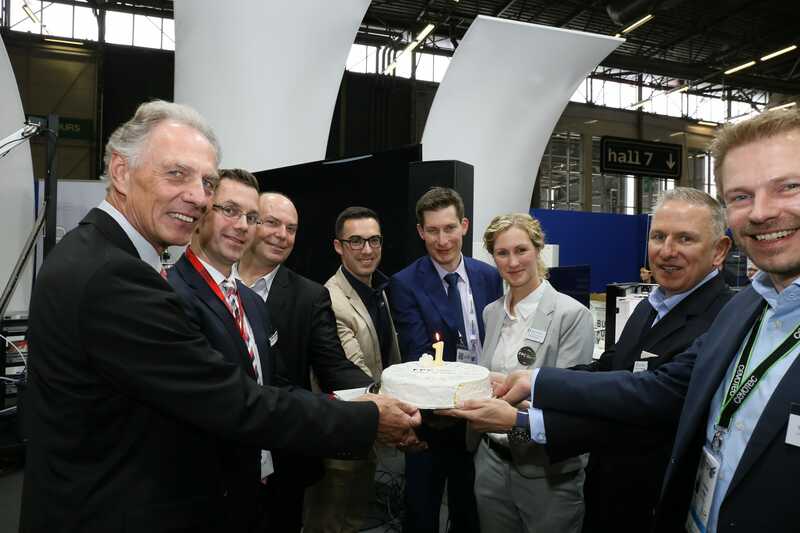 Additionally, we celebrated the first anniversary of the Fiber Placement Center (FPC) at JEC, which is an initiative lead by Fraunhofer and SGL along with several industry partners. We were not only welcomed as congratulants, but as new partners, together with Coriolis Composites. Along with the partnership, the Fraunhofer IGCV will install a SAMBA Pro Prepreg system in the FPC headquarter in Meitingen by mid-2020, which will complement the FPC’s range of services with the novel Fiber Patch Placement process. We are looking forward to further developing our technology and create new applications together with our partners of the FPC! We received one question over and over at the JEC: what does a minimum viable SAMBA system set-up look like to start developing parts with Fiber Patch Placement? We don’t want to hold back with the answer and share it with you: a simple placement cell, consisting of a placement robot with a vision camera and a tool holder or manipulator, is often enough. The system is digitally copied to our ARTIST STUDIO software, which allows you to design parts and program the robot fully automated. The material feed is initially manual, which gives you flexibility in terms of material choice and size. Depending on your requirements, you can add more options, also over time: a material heating unit, a semi-automated tray material feed, a second camera for automated patch detection, and of course any kind of robot configuration that you desire. Contact us to discuss the configuration that fits your requirements and budget. In addition to our customized full-service product development services as part of our cevoLab, we created new development options following several requests from our customers. Especially in cases when FPP is the technology of choice for several products, we offer to in-source the product design process to our customers. Provided with the latest version of our ARTIST STUDIO software and the insider knowledge of an in-depth workshop, our customer’s development teams design and iterate the laminates with support from Cevotec. Benefits include the early knowledge transfer and know-how build-up during the product development phase, in addition to reduced development cost. We at Cevotec verify designs and offer to manufacture prototype parts on our inhouse SAMBA systems for your testing and iteration requirements. Read the latest articles about Fiber Patch Placement and Cevotec at JEC World! It was a pleasure to meet you at JEC World. Don’t hesitate to arrange a meeting for the upcoming events or in between! . You think that information about Fiber Patch Placement is also relevant for your colleagues and business partners? Please do not hesitate to forward the newsletter – here’s the link to our subscription page.